Duncan Jones has made a swift transition from creating advertising for the likes of FCUK to his debut feature film Moon. An impressive number of film festivals have showered Jones’s (a.k.a Zowie Bowie) science fiction feature with praise since its premiere at Sundance in early 2009. 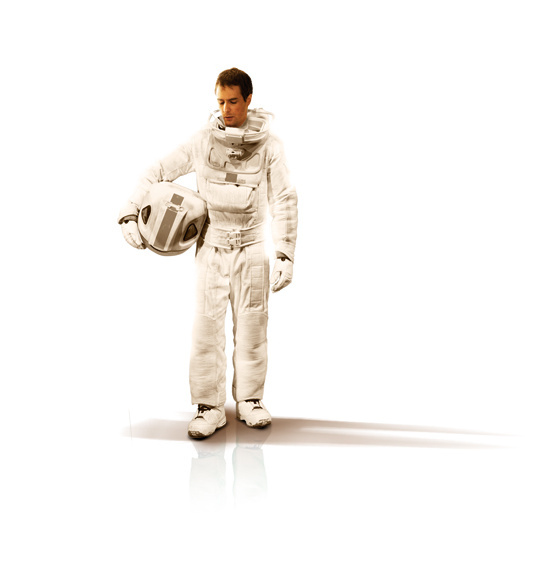 Jones’ personal experiences of loneliness and self-discovery over his past 38 years on Earth have shaped the touching, and at times shocking, experience of protagonist Sam Bell’s (Sam Rockwell) psychological turmoil of his three year stint mining Helium-3 on the moon. His only companion on the dusty grey rock is GERTY (voiced by Kevin Spacey): a robot resembling a ceiling-mounted photocopier with a somewhat patronising emoticon interface, the adventures and misfortunes of Sam are beautifully portrayed in a film that questions individuality whilst relighting the genre of classic sci-fi. With a restrictive budget of $5 million and the high demands of an audience used to the special effects of Hollywood, Jones has tenaciously battled to launch Moon – and has succeeded. The science fiction genre used to be about commenting on society and exploring philosophical concept. Nowadays, however, it seems to be more about creating exciting action films. Do you think that there are any good science fiction films being made today? I think science fiction on TV has been really good lately, I was a big fan of Battlestar Galactica – which was brilliant I think because it was television so they couldn’t afford to have special effects every episode so they really had to rely on narrative and character. That’s what it used to be like in science fiction at the cinema. I think one of the things that has changed over the last couple of years, especially with things like District 9, which is a film that uses a lot of special effects but does it in a clever way, is that the budget in making special effects has come down substantially so you can make a film at a reasonable budget, I think that one cost about $30 million to make. Moon cost $5 million so it was cheap. What were the challenges or restrictions of making a sci-fi film on a small budget? There were a lot of restrictions on what we could afford to do, but as far as creativity, there were really no restrictions. It was an independent film but Sony put some money into it because they bought the rights to distribute it. What that meant was we kind of had carte blanche because we were making a science fiction film for such a small budget that nobody really knew how to change it without it all becoming too expensive so we were left to our own devices. I understand that you used a lot of models rather than relying on CGI? Yes, we used a lot of traditional techniques - we had two sound stages at Shepperton Studios and in one of them was a beautiful 360 degree interior of a moon base which we built and we would go in through the airlock in the morning and they would close it up and we’d be there for the rest of the day. And in the other sound stage we had a lunar landscape which was about 20 ft by 30 ft and there were fantastic model miniatures of the rovers that would drive about on the surface of the moon. They were being pulled across by bits of fishing line, so it was kind of like the old Thunderbirds or something, the way we were approaching the models. With the post-production we did on top of that, it really does have this really unique, and I think beautiful, look to it. What inspired you to set a film in space? Really it was meeting Sam Rockwell, I had met up with him because I had sent him a script for a completely different project and he loved the script but wanted to play a different role to the one I wanted him to play. So we agreed to meet up and when we started to talk about the kind of roles, as an actor, he wanted to play and our shared interest in films such as Sean Connery’s Outlander and Ridley Scott’s original Alien film, we decided to make something like that. So that is what Moon was - it was written for Sam Rockwell. Was it important for you to make a sci-fi film that depicted a plausible future? Absolutely, for those who are science fiction geeks like myself, there is a real differentiation between hard sci-fi and soft sci-fi and hard sci-fi is science fiction that attempts in one way or another to extrapolate and build upon real science. There was a book by a gentleman called Robert Zubrin called Entering Space, which was all about how humanity might go about colonising the solar system, and one of the chapters in that book was setting up Helium-3 mining facilities on the moon, so that’s where the original idea came from. Moon addresses the psychological struggles of an isolated moon-worker. Do you feel that Moon reflects humanitarian issues such as exploitation in industry? I think that was more of a secondary element to it, that was certainly in there, but it was more of the science fiction setting of it. For me the focus was always on character and it was really about what it would be like for a person to be away doing a job on their own for three years, isolated. There were a lot of things, personally, that I wanted to write about. My girlfriend at the time was living on the other side of the world so the feelings that you have when you have a long-distance relationship was something that I really wanted to talk about. Sam was going through a similar thing with his girlfriend, so we had a lot in common and we both understood how it made you feel and that was something quite interesting to talk about. Another part of it was the idea of meeting yourself from a different period of your own life, which is something that I thought would be fascinating as well; an interesting thought experiment, because I know I’ve changed so much since I was younger – the difference between me in my teens and then me in my mid-twenties and me now, it’s like completely different people and I thought it would be interesting if you stuck two of those people together. How did you get Kevin Spacey (voice of GERTY) involved in the film? Can you tell me anything about possible follow-ups to Moon? A There is not going to be a sequel, what I am hoping to do is make another science fiction film which take place within the same universe as Moon. What that would be is a thriller that takes place in a future Berlin. What links these two films is that Sam Rockwell, who is in Moon, will come back and do a cameo in this film, and you’ll kind of get an epilogue to Moon in the background of what is going on in the next film. One of my favourite science fiction films was Ridley Scott’s Bladerunner and although there have been attempts to make other city based sci-fi films, I don’t think anybody has ever come close to doing what Bladerunner did. Your father David Bowie has acted in quite a few films over the years, were you ever invited onto film sets, and how has this influenced your work with film? Definitely, from a very early age I was on film sets and there was a few times when I was a teenager and I got the chance to do little jobs on the set and then as I got older I took the opportunity to do more serious jobs on films shoots. The one which was most important to me was when I worked with Tony Scott on a film shoot The Hunger which my dad was doing and I worked with him for about two weeks as a camera operator and that was an absolutely fantastic experience and that really changed the direction of my life – I was full-tilt in academia at that time, I was at graduate school in my mid-twenties; and not enjoying it! I was on a PhD track in Philosophy. But working with Tony Scott dramatically changed my life. After that I left graduate school and went straight to film school and didn’t look back.